I speak at many industry conferences throughout the year, where the majority of the audience are shippers — that is, supply chain and logistics executives from manufacturing and retail companies. At the recent McLeod Software User Conference, however, I delivered a keynote address to over 1,000 attendees, and most of them were carriers and transportation service providers. McLeod Software might not be a household name among shippers, but the company is celebrating its 30th anniversary serving the trucking and carrier community, an impressive milestone when you consider all of the software companies that have come and gone since 1985. For my keynote presentation, I was asked to give the carriers in the audience a perspective of how emerging trends and technologies will impact shippers in the years ahead, which will ultimately impact them too. How do you plan for the future of transportation? I answered that question by focusing on three trends in the spotlight today — 3D printing, driverless trucks, and drones — and how they might impact WHAT is shipped, WHERE it’s shipped to and from, and HOW it’s shipped. I’ll write more about this topic in a future post, but you can read a nice summary of my presentation by Kevin Jones at Fleet Owner. Today, I want to focus on what I learned at the conference, from the other side of the table, the carrier side. “If you haven’t realized it already, you’re in the information-handling business as much as you’re in the freight-handling business,” said Tom McLeod, President and Founder of McLeod Software. Over on the shipper side of the table, there is plenty of talk about how to become a carrier-friendly shipper — that is, how to make yourself a preferred shipper in the eyes of carriers, especially when capacity gets tight. 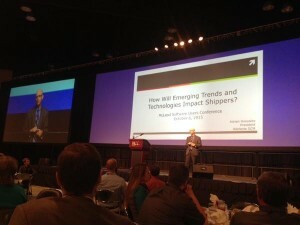 McLeod’s comment points to the carrier equivalent — if you want to be a carrier of choice for shippers, you not only need to meet their capacity and service level requirements (at a competitive cost), you also need to meet their information requirements (i.e., provide them with timely, accurate, and complete data/info). Two other popular sessions were also focused on pricing: McLeod Profitability Analysis and McLeod Market Insight, a community-based benchmarking service that collects pricing data every night from participating McLeod Software customers running LoadMaster or PowerBroker. The solution was launched last year and more than 230 customers are currently participating. Just like shippers are using similar benchmarking solutions to make smarter sourcing decisions (see, for example, Chainalytics’ Freight Market Intelligence Consortium, LeanLogistics’ LeanDex® Transportation Index, and MercuryGate’s RateFriend), carriers are using Market Insight to make smarter pricing decisions. Turnover rate for married drivers was 25% compared to 75% for single drivers. Turnover rate among rehires (drivers who left, but then came back) was also very high. Drivers who had been out of the workforce for a long time also had a high turnover rate. Carriers are leveraging social media more aggressively, especially Facebook, to attract drivers. Making the training and orientation process for new drivers as quick and effective as possible is a priority. One carrier reduced the process from 2.5 days to 1 day, in large part by moving some of the training online. Carriers generally pay the travel expenses for new drivers to attend orientation, in addition to paying them a weekly stipend (about $400+ per week). In terms of improving retention, the panelists all agreed that discussing the driver’s expectations upfront, such as how many miles they want to drive per week and how often they want to be home, is very important. Carriers can then take these expectations into consideration when assigning loads and routes. Developing meaningful relationships with drivers is also important. This includes basic things like knowing their names (instead of referencing them by their ID number), as well as recognizing drivers for their accomplishments (e.g., safety record, “Million Mile Club,” years of service, etc). There were plenty of other interesting sessions at the conference, but I didn’t have time to attend them all. My main takeaway from the conference is that shippers and carriers, especially small and mid-sized ones, are in the same boat: the days of getting by using spreadsheets and manual processes are coming to an end. As transportation operations become more dynamic and complex, shippers and carriers need to make smarter decisions faster, and the only way to keep pace is by leveraging transportation management software. And it’s doubly important for trucking companies, because not only is technology critical to enabling profitable growth, it’s also the foundation to becoming a provider of business intelligence to shippers. Yes, carriers, you’re in the information-handling business too, and the sooner you realize it and adjust, the better positioned you’ll be for success. Note: Elemica, LeanLogistics, MercuryGate, and Transplace are Talking Logistics sponsors.